The Red Sox announced early Saturday morning the acquisition of right-handed relief pitcher Brad Ziegler from the Arizona Diamondbacks in return for second baseman Luis Alejandro Basabe and right-handed pitcher Jose Almonte. In dealing for Ziegler, the Red Sox acquired a right-hander with experience pitching in the late innings of games. With the Koji Uehara's recent struggles and injury concerns with Craig Kimbrel’s knee and Junichi Tazawa’s shoulder bringing uncertainty to a relief core already weakened when Carson Smith was lost for the season for Tommy John surgery, augmenting that group had become a priority. This was the third trade of the last 36 hours for the Red Sox following the Aaron Hill acquisition on Thursday and Michael Martinez acquisition on Friday. The cost to acquire Ziegler was more substantial than the Hill trade, as Luis Alejandro Basabe had established himself as one of the better prospects in the low minors of the system and Almonte has shown some potential, albeit now in his fourth season with the organization and first above short-season ball. - The primary piece heading back to Arizona is second baseman Luis Alejandro Basabe. Basabe, whose twin brother Luis Alexander was his teammate with the Greenville Drive prior to the deal, signed for $450,000 back in August of 2012. At the time they signed, the Basabes, who come from a part of Venezuela near the Colombia border where soccer is far more popular than baseball, were relatively new to the game, having only started playing a year or so before signing. 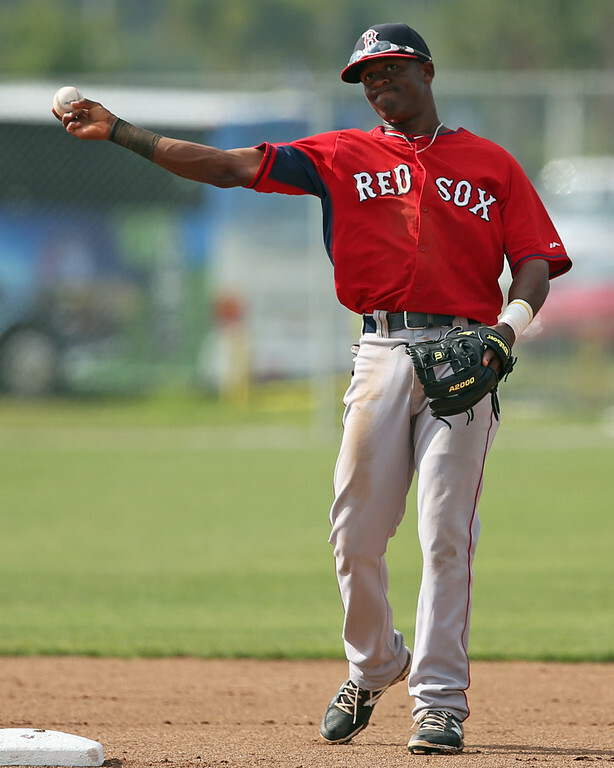 While Luis Alexander burst onto the scene last year after getting pushed to Lowell, Luis Alejandro stayed back in the Gulf Coast League and put up a respectable, but not extraordinary, line of .260/.387/.310 with no home runs and eight stolen bases. During spring training of this year, however, Luis Alejandro impressed enough in a limited look that he started the season as the number 34 prospect in the system (after being previously unranked), broke into the top 20 in our midseason rankings at number 18, and was in line to be right on the cusp of the top 10 in the upcoming update following the July 15 draft signing deadline. Though he is only 19 years old, Luis Alejandro has surprisingly advanced approach and feel for hit, and that has showed as he has put up a .310/.412/.467 line in his first go-round of full season ball. Basabe does not have the type of frame that stands out, looking his listed size of 5-foot-10, 170 pounds. He is a solid athlete and does have some projection left with room to fill out as he matures without sacrificing his speed or athleticism. A switch-hitter, Basabe has a solid swing from both sides of the plate. He starts square with simple set-up and swing mechanics. He utilizes a toe tap timing device, getting his foot up and then down quickly and ending up in a good hitting position. He has quick hands and strong feel for hit with a simple, level swing. He has a line drive approach, but has shown a willingness to use all fields and the ability to square up velocity up into the high-90s. Given his youth, Basabe has shown a strong understanding of the strike zone and decent pitch recognition skills. Overall, he has the potential for an above-average hit tool, capable of hitting in the .275-.285 range, though given the improvement he has already made in this area, you could even go a tick higher than that. Even though he is not very big, Basabe will also show sneaky power. It is more gap power right now, but at his peak, it is not a stretch to project him for below-average game power (10-12 home runs annually). Basabe also will add some value on the bases, though he is not a burner. He is an above-average-to-plus runner, though as he matures I suspect he will settle in a tick under plus. Defensively, Basabe had played some shortstop as well this season and last, but after seeing him in drills and in game action it was clear his long-term home would be second base. This is apparently something the organization has realized as well, as he has exclusively played the keystone for just over a month. Even at second base, Basabe lacks the fluidity and natural actions you usually see in the middle infield. In watching him play the field three times last weekend, he made several errors due to sloppy footwork, and his throws—especially on double play balls—were not that accurate. He had some trouble making the transition from glove to throwing hand on those plays, and as a result had to rush his throw, which led to trouble. He does not have the natural actions nor the softest hands, but with time and continued repetitions, he is a good enough athlete that he should be able to settle in as an average defender. He only has an average arm that profiles at second base, though if need be he could probably pass at the other infield positions and maybe even the corner outfield in short stints. Looking at Basabe’s entire package, you see someone with the upside to be a hit-first regular at second base. Even if he does not reach his ceiling, he still has potential to develop into a solid utility player, especially if he shows that his approach will translate against more advanced pitching. 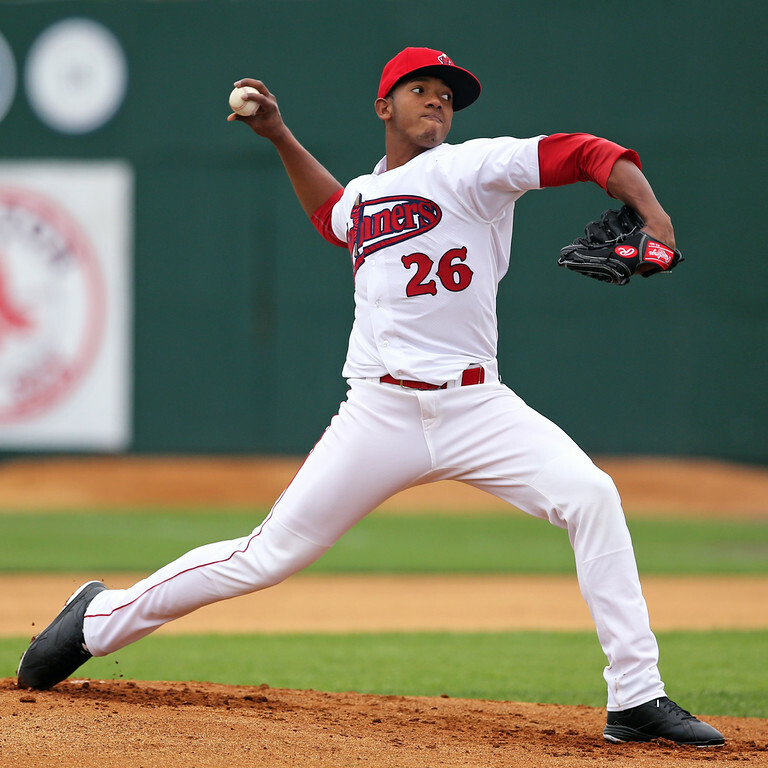 - Right-hander Jose Almonte was signed back in July 2012 out of the Dominican Republic for $610,000. His development had been relatively slow up until this point, moving up one level a year and finally reaching full season ball in mid-May of this year after spending six weeks in extended spring training. With Greenville, he showed strong ground ball tendencies and good control, walking only 13 with 45 strikeouts in 53 innings while allowing 50 hits and 23 earned runs for a 3.91 ERA and 1.19 WHIP. He is less heralded than Basabe, but in a recent start showed an intriguing arm. Almonte throws from a high three-quarters arm slot, starting like he is going to throw from the wind-up before shuffling his feet to end up like they would from the stretch. He has a short arm action, including a stab and wrist pronation behind, and gets some deception from keeping his arm behind his body until late in his delivery. Almonte does a good job keeping his fastball down and generates a lot of weak contact on the ground. He usually comes out throwing 90-92 mph early and tops out at 94, but as he works deeper in games, he tends to lose a bit of velocity and ends up in the 88-90 mph range. His fastball has natural cut that he gets from how his wrist works behind his body. He will show three secondary offerings—a slider, curveball, and changeup—but none project as better than average. Almonte throws his slider 81-83 mph with short vertical break; the curveball at 76-78 mph with longer, 12-to-6 break; and the changeup at 82-84 mph. He has the most feel for his curveball, and has the confidence to throw it both early to get ahead and late to put hitters away. His changeup will show some drop, but in a recent look he tended to slow his arm when throwing the pitch. Long-term, Almonte is best suited for a bullpen role, where he could focus on one breaking ball and air out his fastball without having to worry about holding something in the tank.